ICIS news reports that US soybean acres set record, corn also huge. HOUSTON (ICIS news)--US farmers planted 77.5m acres to soybeans in 2009, the highest on record, while corn plantings were at near record levels, the US Department of Agriculture (USDA) said on Tuesday. In its highly anticipated crop acreage survey, the USDA also reported that 2009 corn plantings were estimated to be up 1% from last year to 87m acres, the second largest planted acreage since 1946, and 7% below the all-time record 96m acres in 2007. Record US soybean and near record corn plantings this year would provide downward pressure in the near term on prices for the biodiesel and ethanol feedstocks, sources said. The USDA said the estimated soybean harvest area would be 76.5m acres, up 3% from last year, and would be the largest on record. Planting across the US Corn Belt was behind normal this year, with rain and cooler weather, but drier weather in late May brought the planted acres into range with the 10-year-average. In the key state of Iowa, 13.7m acres were planted to corn, up slightly from the reported acres in June of 2008. Nearly all corn planted in Iowa had emerged with 81% of the crop rated excellent/good and an average height of 37 inches- well above "knee high by the 4th of July," the Iowa Department of Agriculture said. The extended outlook for Iowa was favourable for near-perfect corn growing weather, the Iowa Corn Growers Association said. Commodity Online reports about heavy rain hits Iowa soybean and corn badly. DES MOINES : U.S. Department of Agriculture (USDA) said heavy rainfalls in Iowa hit soybean and corn crops badly and slowed hay harvest and weed control efforts. Severe thunderstorm brought crop-damaging winds and hail in some isolated cases. Flood concerns continued in southeast Iowa, the report said. Farmers had only 2.2 days suitable for field work during the week ending Sunday, compared with an average of 4.9 days for the same week in previous years. The rains of recent weeks have left about 35 percent of the state's crop land with surplus moisture. Radio Iowa reports that heavy winds damage crops in northwest iowa. Heavy winds and hail ravaged corn and soybean crops in northwest Iowa's Sioux County on Wednesday night, near the town of Craig. Paul Sogn, an agronomist with the Farmers Coop Society, says while the corn was badly damaged, some of the soybeans may come back. He says much of the corn was defoliated and the stalks were bruised. Some of the beans were badly damaged but he says some may still be able to recover. Sogn says there may be an outside chance for some replanting of soybeans, but time is running out on that. He says we're right on the border now and there have been some cases where beans were replanted but he says that's "kind of pushing the limit." Sogn says before the storm hit, the crops in that region were looking average to above-average. The Hawkeye reports that wet weather dampens outlook for farmers. Warm weather has helped spur growth. As Gary Kester drove down gravel roads in a pickup late last week gazing at the about 700 acres of land he cares for, the Des Moines County farmer saw potential despite a spring plagued by yield-hampering excessive rains. Thanks to a week-long hot spell, crops in southeast Iowa and west central Illinois have begun to shoot up following a slow spring start, although some area fields received damage during severe thunderstorms, flash floods and high wind, which accompanied the warm weather. Since January, the Southeast Iowa Regional Airport has reported 26.79 inches of precipitation, which is 8.82 inches more than the 30-year average, according to the National Weather Service in the Quad Cities. That's even more rain than the first six months of last year, which saw 21.43 inches. "I'd say this year is one of the most unusual years we've had in the last 20 years," said Don Fry, executive director of the Des Moines County USDA Farm Services Agency. "Because it seems like it rains every second or third day, the ground is constantly kept wet. We've heard a lot of reports from people with wet spots turning up in fields that they and their parents ... don't ever remember being a wet spot." The combination of constant rain and cool temperatures this spring kept farm fields saturated, making planting difficult and hampering crop growth. Also, frequent rains have rinsed a portion of nitrogen fertilizers from fields and hindered the application of herbicides, all of which cuts into yields, Kester said. "This spring has just been a terrible struggle," Kester said. "Anybody that mowed hay within the last three weeks probably lost their hay crop because it got wet." The longer alfalfa sits in the fields past its prime, awaiting harvest, the more nutrients it loses, reducing its quality and worth. This year, Kester -- a third-generation farmer -- made it into his fields to plant twice, once during the third week of April and again in the second week of May. While driving on a dirt road, passing hip-high corn on one side and ankle-high soybeans on the other, Kester pointed to a large yellow patch of stunted corn. "That won't yield very good," he said. 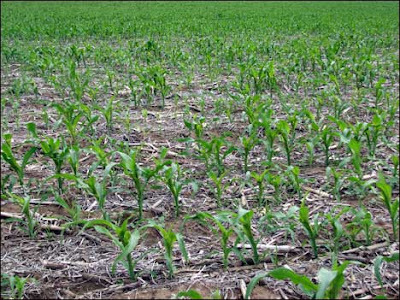 In low-lying areas especially, excessive rain and cool temperatures have hindered the development of corn plants' roots. Usually, corn in southeast Iowa is head high by July 4, ready to detassel, and soybeans are about knee high. This year, the annual act of removing the pollen-producing corn tassels will take place closer to the end of the month, Kester said. There are many area fields yet to be planted. This late in the year, many farmers with empty fields may simply be planning to rely on crop insurance, Kester said. While crop insurance for late or prevented planting helps cover the cost of input, it doesn't necessarily give a return above cost. The rain has affected other crop yields, including wheat with disease and the possibility of lower test weight. As of June 21, almost all Iowa's cornfields had emerged and soybean planting was 98 percent complete, according to the United State Department of Agriculture. The USDA rated Iowa corn conditions as 1 percent very poor, 2 percent poor, 16 percent fair, 58 percent good and 23 percent excellent. Soybean conditions were rated 1 percent very poor, 3 percent poor, 18 percent fair, 60 percent good and 18 percent excellent, according to the USDA. Iowa Farmer Today reports about soybeans in Iowa. How early is early is a question I typically receive each year. I have found the answer to that question varies by farming operation. To get a better understanding of this we planted a demonstration plot in Greenfield, Iowa this spring. Like most of Iowa, we got a late start to the growing season and on many occasions questioned if we did the right thing. So like the old saying, a picture is worth a thousand words, is very true when it comes to crop progress this year. You can make your own decision on the right time to plant. Weather has been and still is a major hurdle this growing season. While I show you pictures of soybeans planted in April some growers are still trying to plant soybeans in the bottom tier of counties in Iowa. Just for reference, the above picture is more typical of soybean planting this year. Timely weed control is the challenge most producers and agri-business face now. In my 20 plus years in the agronomy business 2009 will go down as one of the more difficult years to get anything accomplished. We now have 120' booms and 1200-gallon tanks only to still wait for Mother Nature to give us a chance to get our spraying done. Just remember to slow down and do it right the first time, for in a year like this a second chance is usually not an option. Think safety and patience when things are not going your way. Big sprayers can mean big mistakes. Iowa Farmer Today reports about uneven corn in Iowa. Uneven corn is somewhat common across west central Iowa and is especially noticeable in lighter soils with residue cover. In one field I noticed V6 corn right next to V4 corn and 12 inch corn right next to 6 inch corn. To confuse the matter I found three V5 plants that were 6, 8 and 12 inches tall. So, not only did we have variance in growth stage, but also shoot elongation. [What impact will variability in plant height have on crop yields? It's been well documented that uneven emergence affects crop performance because competition from larger, early emerging plants decreases the yield from smaller, later emerging plants. According to one popular rule of thumb, if two neighboring plants differ by two or more leaves, the younger plant will almost always be barren or produce a nubbin ear at maturity. It is too late to think about starting over, but one could expect a 5 to 25% yield hit. Of course this would depend much delay there is between plants and how long the unevenness persists. For more information go to "Yield Effects of Uneven Corn Height" by Roger Elmore, ISU Corn Specialist. Uneven corn near Castana, Iowa. Demonstration of uneven development and height from uneven corn stand near Castana, Iowa. Left plant is V6 and 12 inches tall, middle 4 plants are V5 and range in height from 6 to 12 inches tall, and right plant is V4 and 6 inches tall. That someone is Alaron, the wholesale switch to soybeans "would mean tossing out expensive corn seed and fertilizers and repurchasing bean supplies. Not likely," they say. My reaction: I share Nogger's reaction to the USDA's Tuesday report. 1) The USDA has published some more ridiculous data. 2) Since January, the Southeast Iowa has had 26.79 inches of precipitation, which is 8.82 inches more than the 30-year average. 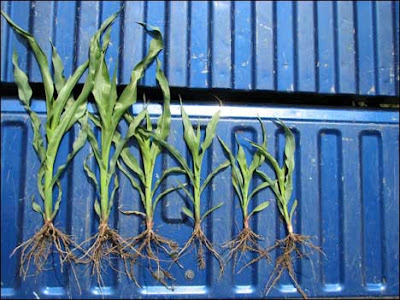 The excessive rain and cool temperatures have hindered the development of corn plants' roots. 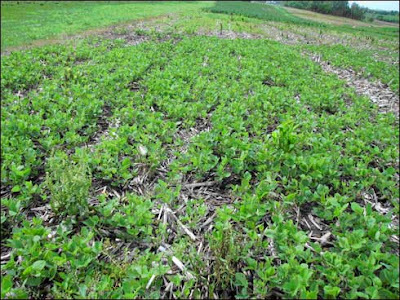 3) On June 24, Heavy winds and hail ravaged corn and soybean crops in northwest Iowa. 4) Uneven corn is somewhat common across west central Iowa, and one could expect a 5 to 25% yield hit. 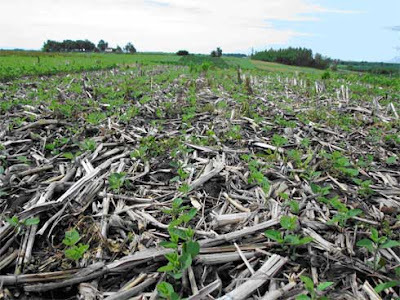 5) the picture for Iowa soybeans isn't pretty this year. Conclusion: The USDA is either unbelievably incompetent or dishonest. Just want to say thank you for undigging information gems that are not covered by other bloggers already. Keep it comin, you are a fixture of my daily reading. I will have to admit that the information you give to the public here is rather unique among the blogosphere you inhabit. And because of this, your blog is one that I come to more then once a day. So keep up the good work, and thanks! One of your bi-polar anonymous readers/commenters. Dear Eric, You seems like want to see bad things happened. What's wrong with your head?? Time to stop reading USDA publications. "Dear Eric, You seems like want to see bad things happened. What's wrong with your head??" What's wrong with USA and whole world? the same articles is in Mish blog. And He thinks this is a deflation fenomena. who is right? Mish of Eric?? USDA planted acreage data for ALL (!) US crops in 2009 has been well above private estimates. Have they discovered a way to produce agricultural land in the US? Welcome to this bold new world! 'Creative' accounting, 'creative' agricultural surveying.. What a BS! The USDA knows exactly what it is doing, and knows that the 'market' watches its figures like a hawk, and reacts accordingly. Consider as well as the Government / Fed / Wall St oligarchy, one consisting of Government / USDA / American multi-national grain trading co's (Cargill in particular). Now China wants to offload USD into something useful like soyabeans. It can buy Brazilian or and American stocks direct. 1) China commits to a tonnage. lets pretend its huge, market shaping. 2) Cargill(eg) or the Trade In The Know (TITK)are charged with getting this order physically together for delivery over the coming year. 3) TITK bounce market around, introducing fear of falling prices. Large shorts on CBOT. USDA chimes in with pile of fiction re crop acres. Prices slide. 5) TITK continues buying physical because there are other customers apart from China! 6) By now we are into autumn (fall) and harvest is long finished for Northern Hemisphere (the hemisphere that matters - no disrepect to Aus / Arg et al). NOTE it does not matter exactly what price within reason TITK has to pay, because when it becomes apparent that supplies may be tight, the price will surge. This sort of infers China / US administration between them 'guarantee' discreetly TITK's activities. Deposit on order? Whatever..
7) TITK closes out those shorts that originally helped spook the market, if they have not already done so. Any loss can be offset by profit on China sale. 8) TITK goes long on paper, to go with being long physical. 9) Now, and only now, line up Panamax vessels to shift produce to China. China wins because it got its huge order filled before any great price movements - in fact TITK were able to take normally risky positions to spook market down simply because they held all the trump cards and could not lose the hand. China ensures it is not ripped off by insisting and getting full transparency on prices paid as the tonnage is put together. US wins because China owes it one. Wins because this does balance of trade no harm at all. Wins because TITK multinationals, all American, are in a position to make huge profit - and pay some much appreciated Tax! Wins because gets to play God with food re foreign policy implications. Read 'The Great Grain Robbery' to see how its done in more detail. (In a nutshell - early 70's - height of ColdWar - USSR harvest fails terribly - real risk of starvation and uprising - USA realises the situation is more dangerous than usual status quo, would USSR army march on Europe etc.... so organises a sort of charity food programme (sic)... Cargill buys all wheat it can around the world, backed by Administration, and starts shipping to USSR. Crop lost into this 'huge new market' leaves not enough to go round between everybody else, and price spikes. Russia happy - well at least not starving. USA happy - no armageddon this year. I find it interesting that despite the widespread news coverage, the government is still able to massage the numbers. Perhaps not to scare the ponies....I'm not quite sure. What I do know is that we are facing a crisis of biblical proportions if there is even a small decrease in food grains this year. Our historic surpluses are now historically low. China is quietly buying up everything in sight in anticipation [perhaps] of something dark on the horizon, and the good 'ol U.S. of A. is sitting idly by, fully hypnotized by the talking heads spewing out their nightly sound bites. We had all better pray that the crops do a hell of a lot better than the reports from Canada and Iowa are insinuating they will. Mark Ancona: "What I do know is that we are facing a crisis of biblical proportions if there is even a small decrease in food grains this year." Not saying the prophecy will be fulfilled this year. But it does remind me of it. Very possible, with one exception. We are in 2009! The US Govt doesn't seem to work like a single entity these days, it's more like 3rd world country, people just grab whatever they can. So it's more likely some guys in USDA are working hand in hand with the trade, for monetary gain, not in the interest of the state. Such a scenario would rhyme well with my yesterdays' technical observations. How do you spook the market lower? You push it just below an important support level, people get a reason to go short, thus allowing the trade to reverse their positions. I would find it astonishing if the USDA staff were found NOT to be corrupt. You know, man is weak, and USDA can really move markets in a BIG way. 1+1=2. Hmmm. MISH, Market Skeptics and Nogger are ffeding off each other. Pretty closed round it seems. Regarding the corn growth. Commerical cron usually grows to a height of about 2.5 meters. Full corn growth can be reached within 85 days. So it can grow more than an inch a day *ON AVERAGE*. If you have warm weather, it should grow faster. If you assume that corn stand height was not pusblished on the day reported, the number easily add up. The typical investor's problem is to do not enough research. Adding to that, what do you think the high prices of last year has done to farmers? If their margin was not down due to energy/fertilizer etc. costs, they have plenty more of cash this year with fertilizer prices way down. Add to that the large amount of acres coming out of preservation and we could really face a glut of wheat etc. -- at least in the US. Doesn't Jim Rogers always tell that it takes high prices to combat high prices? We had them last year. Just look at the natural gas market. The prices went up for the last several years. In the meantime LNG producers threaten to kill natural gas prices globally. When does the ag crisis begin? Still with soybeans in sept? on another tack altogether, it suits Administration / USDA to have prices on floor at this precise time because of 'crop insurance' payout implications. US farmer buys crop insurance, which i think is Federal scheme, and pays out on crop failure for just about any reason, including;- 'couldn't plant because too wet', too dry, hail, wind and so on. Payout based on a good percentage of farm (or county??) crop yield for previous 5(?) years. High premiums - high payout. Not compulsory but considered by many to be important / essential risk management tool. Lending bankers may insist on it. Well, lower the crop price, lower the payout. The key date for price setting / claim assessment is sometime about now. the ag crisis will be a black swan event, and very probably won't be soy in Sept. But might be summer dry heatwave which stuffs late drilled, poorly rooted crops. Or a freak hard early frost. Or everything works out fine and we stagger on for another year. its just a propaganda to improve them deals for the coming time ???????? ?